Through our wholly owned manufacturing & reconditioning affiliates, and as one of largest distributors for plastic buckets, we have the supply & delivery capabilities that assure our customers the best products when they need them. We have been a reliable supplier of drums, providing containers from 1 quart to 330 gallons in quantities from 1 to over 100,000. They are the largest nationwide dealer of new & reconditioned drums available in a variety of materials & sizes. If your company requires quality, affordable plastic buckets, then we are the right place for you. Contact Jakacki now for more information on how they can help you with your barrel & drum needs or check out their website for full product & service descriptions. 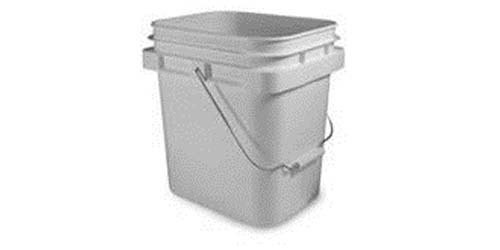 Container Distributors is your source for plastic buckets! We offer solutions for all of your plastic container needs, including all sizes of new and reconditioned plastic containers. We also carry a wide range of cubic yard boxes and IBC/totes. We specialize in plastic containers for environmental hazardous waste and material disposal. Call us today or visit our website to learn more about our plastic buckets and other products! Plastic buckets are round plastic containers. They are designed in many sizes and configurations and can be engineered to varied specifications. Most other kinds of plastic containers share plastic buckets’ ambiguity of purpose; the words “plastic buckets” are not prescriptive of a specific design or function, but descriptive of a general concept. Plastic buckets generally tend to be portable, round containers of small to medium size that are used for the transportation or storage of a range of materials in small quantities. They tend to be smaller than plastic tubs, though there are exceptions; they also tend to be larger than plastic bottles, though there are exceptions. They can be large enough to transport emulsifier on a commercial or industrial scale, or they can be small enough for making beach sandcastles. The lifespan of some plastic buckets might involve both, given their reusability, light weight and low cost, though this would be more likely if the bucket originally contained consumer products. Most plastic materials’ ease of recyclability makes them attractive materials for container construction because many containers are only needed once for the transportation or delivery of a product. Virtually every industry makes some use of plastic containers, and many of those containers are designed as buckets. The manufacture of all plastic containers involves either a blow molding or injection molding machine. 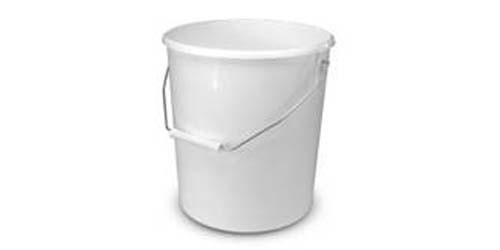 Many buckets are made out of high-density polyethylene. HDPE is a durable, non-reactive thermoplastic that resists impact and inhospitable climates during transit or storage. In the blow molding process, raw HDPE resin, which in the beginning of the molding process is called stock, is loaded into a hopper. The hopper then directs the stock into a conveyance channel where a large screw forces the stock toward a mold. As the screw turns, the combination of friction and pressure heats the stock. This heating, combined with extra heat provided by heating elements along the channel, heats the stock to the point of liquefication. At this point, the liquefied stock enters a mold cavity and takes its shape. Compressed air is then blown into the cavity, hollowing out the middle of the plastic mold. Once the molding process is finished, the product is allowed to cool and harden. It is then ejected from the mold, cleansed of imperfections (if they are present) and either shipped or sent for additional processing.